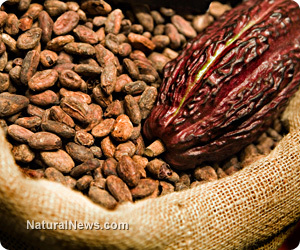 (NaturalNews) New research suggests that red wine and cacao, from which chocolate is made, can help prevent type 2 diabetes. The research is likely to be seized upon by the sugar industry, which [recently] struck out against being "demonized" by pressure groups. Researchers at the University of East Anglia conducted the study and published their results in the Journal of Nutrition. It was one of the largest scientific studies of the effects of flavonoids on type 2 diabetes conducted to date. According to the 2011 figures from the Centers for Disease Control, type 2 diabetes affects 8.3 percent of the U.S. population, or about 25.8 million people; FT reported that about 2 million Brits are affected by the disease. In conducting their study, East Anglia researchers collected and analyzed blood samples and monitored food consumption of 2,000 volunteer subjects. "We found that those who consumed plenty of anthocyanins and flavones [types of flavonoids] had lower insulin resistance," said Professor Aedin Cassidy, the research leader. "High insulin resistance is associated with type 2 diabetes, so what we are seeing is that people who eat foods rich in these two compounds - such as berries, herbs, red grapes, wine - are less likely to develop the disease." The biochemical mechanisms behind the findings are unclear, though the researchers suspect that flavonoids raise levels of a protein called adiponectin, which regulates glucose metabolism. Tim Spector of King's College London, who was also involved in the research, called it "an exciting finding that shows that some components of foods that we consider unhealthy, like chocolate or wine, may contain some beneficial substances." However, Alasdair Rankin - research director of the charity Diabetes UK - said the study's results should be taken with caution. "There have been contradictory findings from other studies and, also, even if high flavonoid consumption and lower type 2 diabetes risk do tend to happen together, it does not necessarily mean that one is causing the other," Rankin told the paper. Rankin said warnings to limit consumption of chocolate and wine would remain in effect for the foreseeable future, even if it is proven beyond a doubt that flavonoids reduce the risk of contracting diabetes, "because any health benefit from the flavonoids would be dramatically outweighed by the calories in the chocolate and the alcohol in the wine." A British industry group, the Food and Drink Federation, did not issue any comments on the research results. However, the group has said that "demonizing" sugar in the fight against diabetes was "over-simplistic." In addition, the group described as "disgraceful" a broadcast media report stating that a number of government advisers had "worryingly close" ties with sugar producers. -- Researchers from the Harvard School of Public Health developed a study to analyze a specific sub-class of flavonoids, called anthocyanins, that have been shown to help dilate arteries, counter the buildup of plaque and provide other cardiovascular benefits. The study's results, which were published in the journal Circulation, indicated that women who ate at least three servings of blueberries and strawberries per week had significantly fewer heart attacks. -- A separate study by researchers at Harvard's public health school found that flavonoids from blueberries and other natural foods significantly lowered the risk of type 2 diabetes. -- In a 20-year study, it was found that participants with the highest intake of flavonoids and proanthocyanidins had a 44 percent and 40 percent lower risk of oral cancer and laryngeal cancer, respectively.